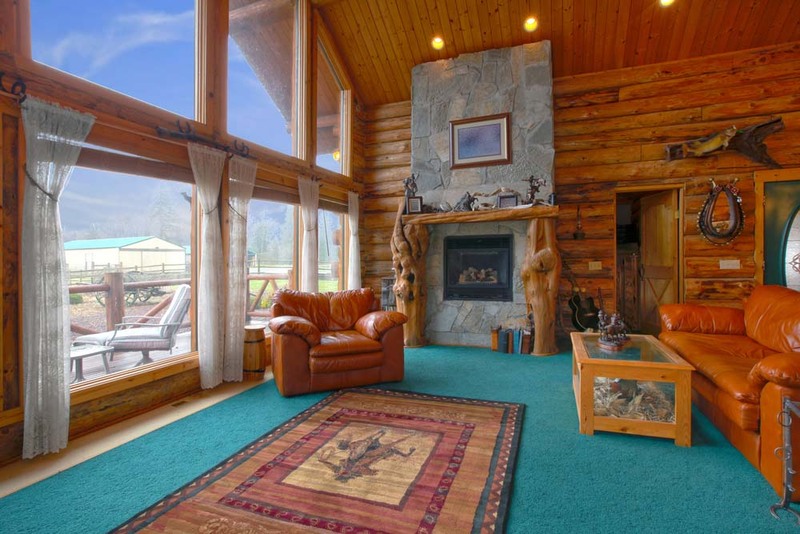 Log homes are hard to look away from as you drive by and take in the dramatic roofline peaks, round logs and other elements. They look natural and fit in well with a variety of surroundings. 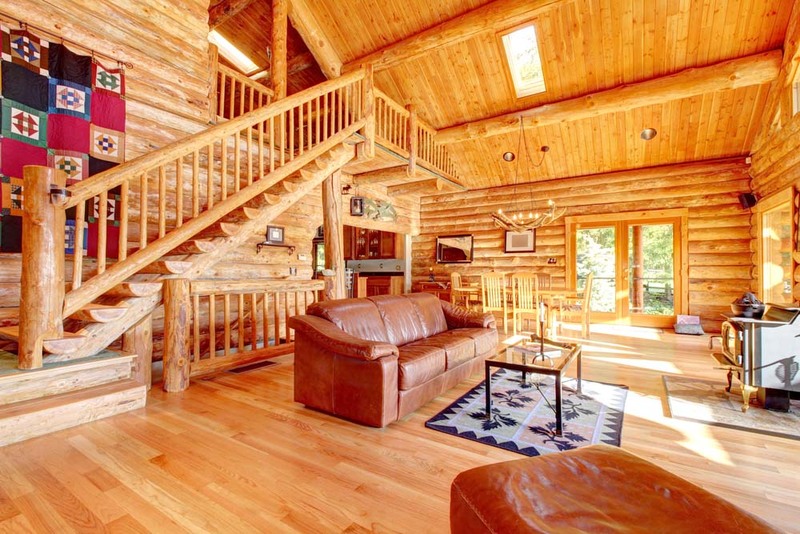 As lovely as the exterior of a log home is, the interior can be just as gorgeous, if not more so. 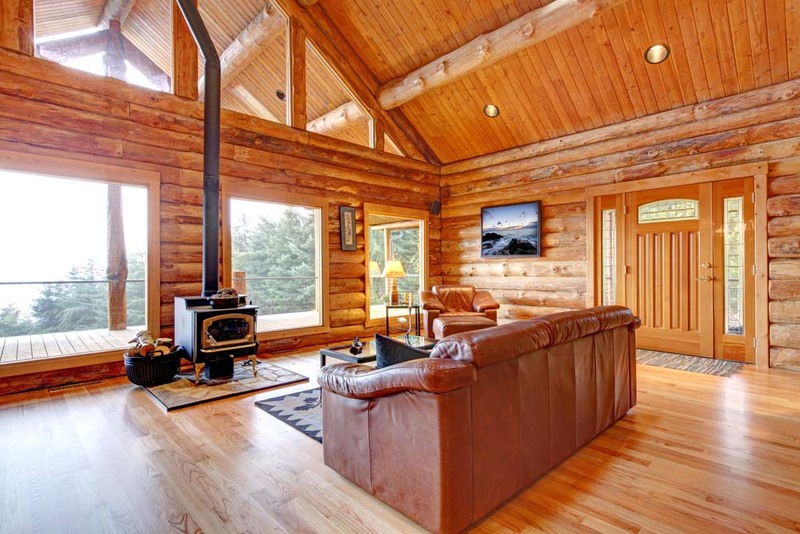 Log home owners can do a number of things with the inside of their home. Some like to continue the log look and keep things as natural as possible while others like to go more modern and add splashes of color and different styles. 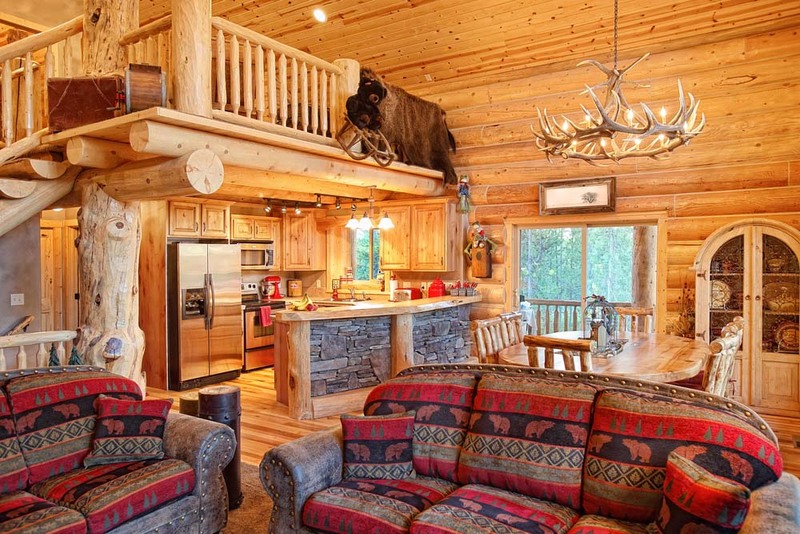 Many log homes have a more open floor plan, but even with the most open plan, there are still individual rooms and they can each take on their own style. Homeowners can decorate the bathroom, bedroom, and kitchen in a variety of manners. 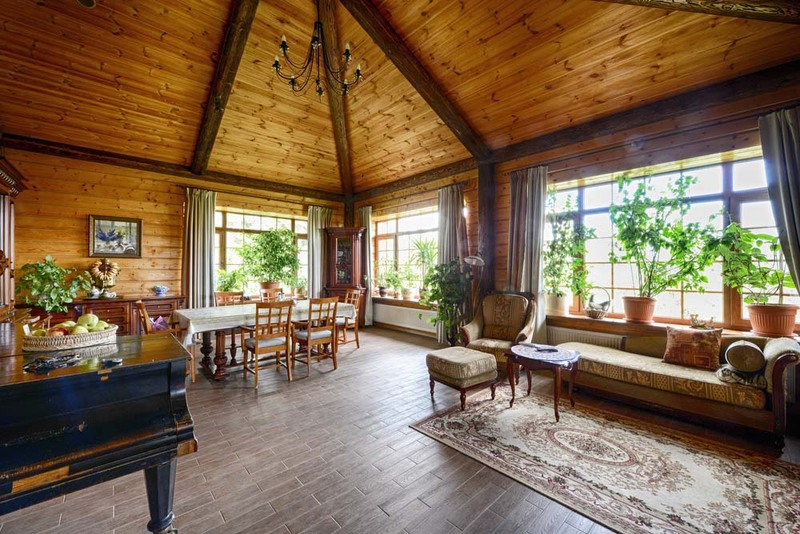 If the logs on the outside of the home also show on the inside, the wall colors may remain the same throughout the home, but that does not mean the color scheme of each room can’t vary. Windows often let in a lot of natural light in a log home and window coverings can add to the style of any room. The flooring can also differentiate one room from another. 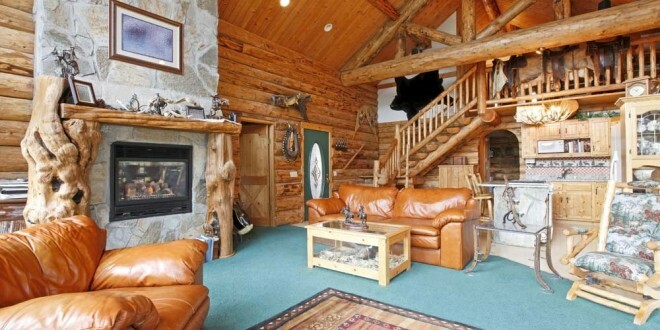 Lighting and other accessories along with furniture all make each room its own, even if they all fall under the same log home. 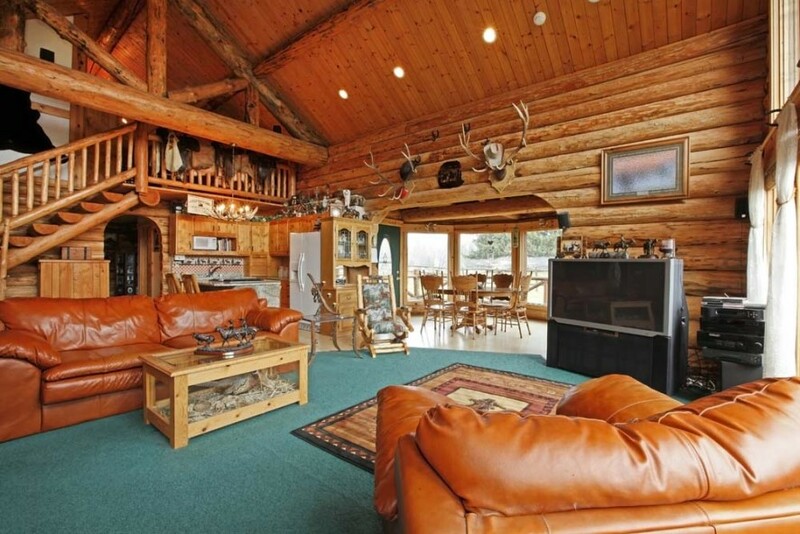 Here are some examples of what homeowners with log houses have done with various rooms. The living room is a well used portion of the house. 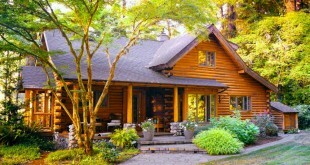 It is where the family gathers to spend time together. It is where guests come to visit. It is a versatile room that can be used for many different things on many different occasions. Log home living areas have the opportunity to become an astounding portion of the home. These pictures prove it. 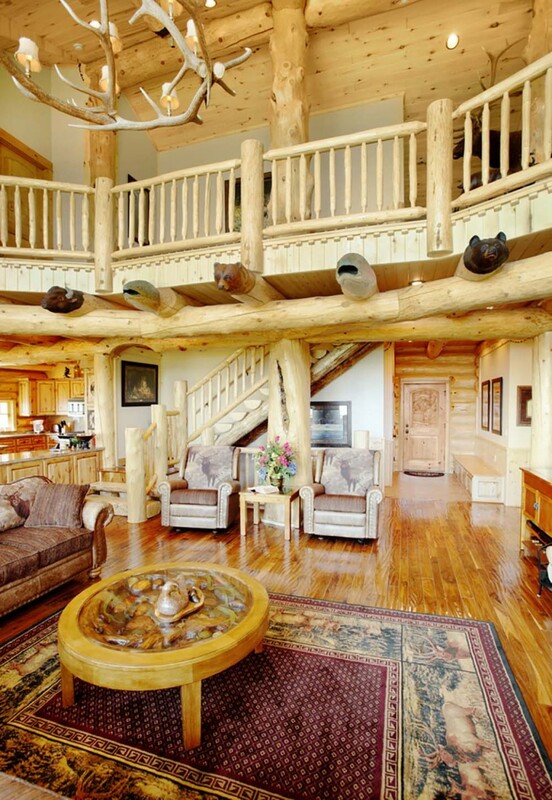 This beautiful living area minimizes outside decorations and takes the log look to the fullest. With flooring that fits in, the only different colors come from the furniture and rugs. The minimal approach makes the room look large and allows the space to be highly versatile. 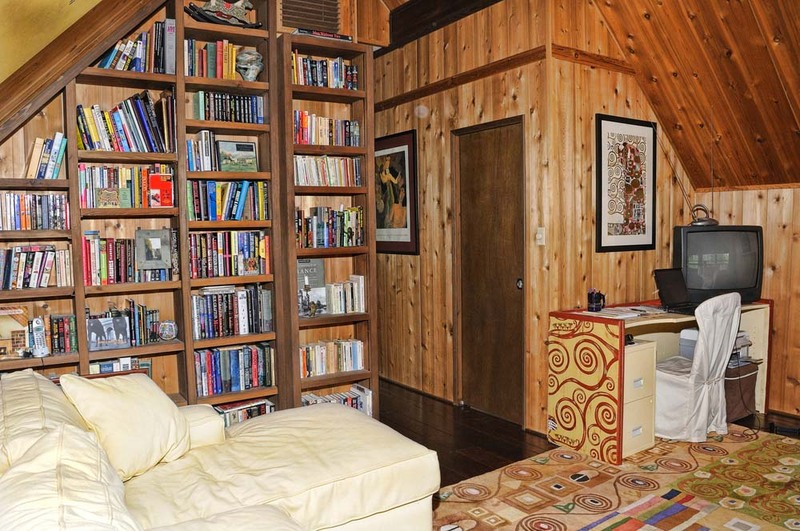 This living area looks more like a cozy den. The fireplace with rock surround warms the room, even when it is not running and the patterns on the couches brings a comfortable element into the space. 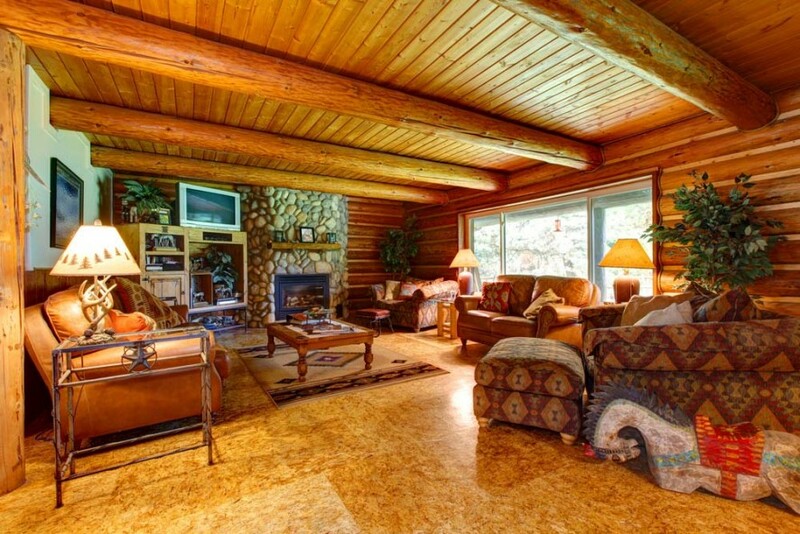 The logs are still prominent, but they are not the only attractive quality in the room. This open living area flows right into the kitchen, but the spaces are broken up nicely with brightly colored couches. The color difference works well to highlight a different style other than the beautiful, overwhelming amount of wood. The furniture sticks to a natural, woods theme and fits right in while standing out at the same time. 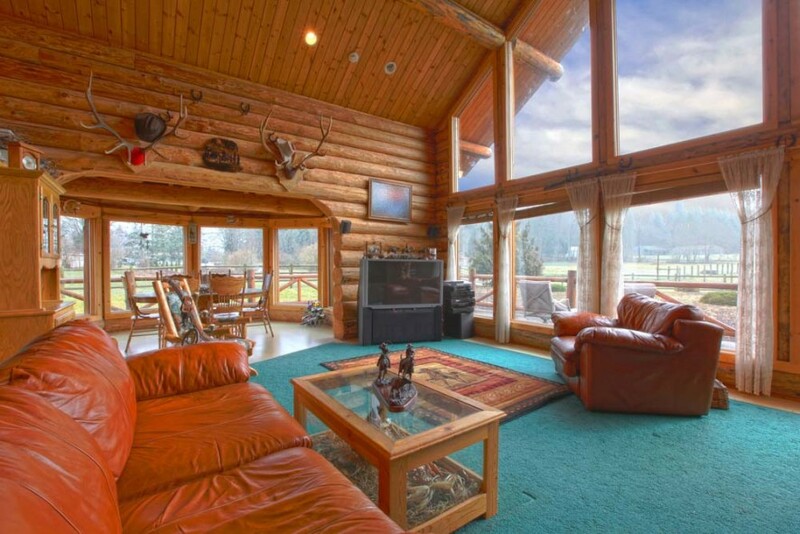 Contrasting wood often looks amazing in a log home living room. The darker wood floor highlights the light wood walls and allows darker furniture to bring the whole room together. All of the items in the room appear natural, just like the overall log look. This cozy living area fits a lot of items into one small space, but manages to look spacious enough. The knotty walls flow into the dark floors and the light couch helps bring extra light into the area. Homeowners take advantage of as much wall space as possible with built in bookshelves and the patterned rug gives the room personality. This living room has so much natural light it could get overwhelming at certain times of the day. The dark wood and deep armchair bring the light level down a bit while enhancing the view. 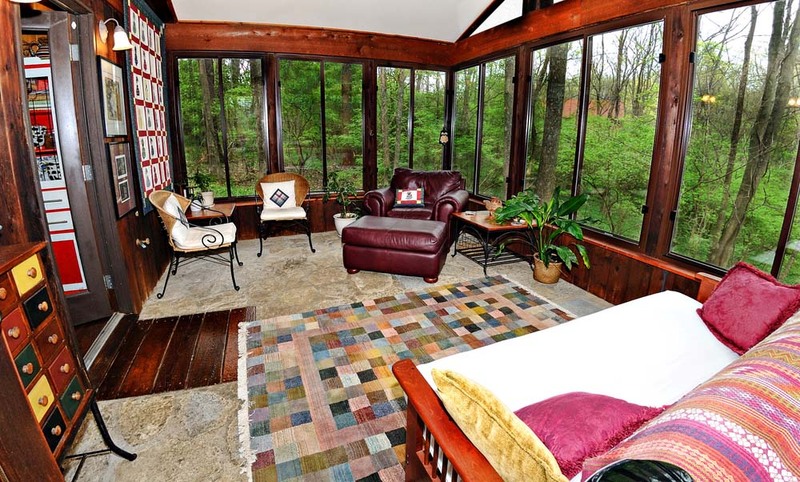 The room also features some brighter colors in the rug and wall hanging so the space is never boring. The pitched ceiling in this room makes it feel large, spacious and elegant all at once. The oriental rug continues the elegance while the couch blends into the look. The deeper floor color ties the room together while setting off the beauty of the walls and ceiling. This room is a great place for family to gather and enjoy an evening together watching a movie. With comfortable couches that slightly contrast the wood color and a bright floor, the room looks comfortable for any occasion. The natural lighting brings plenty of bright sunshine into the area to keep it open. 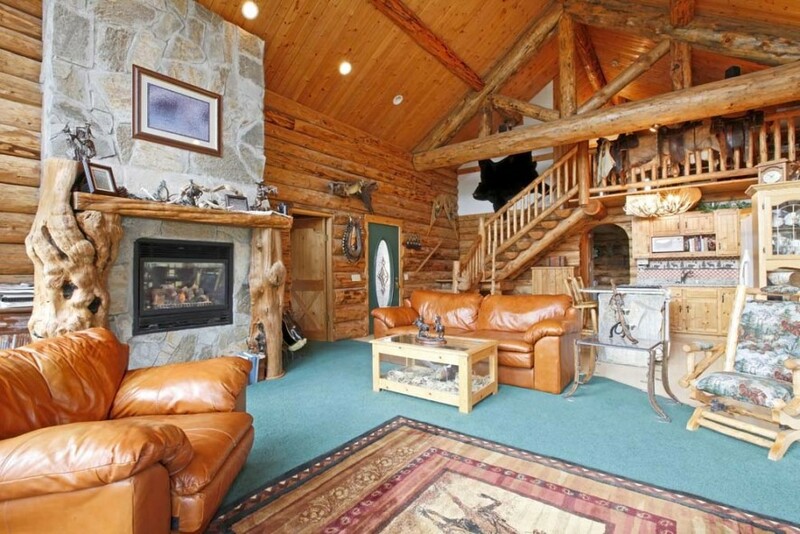 It is hard to decide where to look first in this gorgeous log living room. 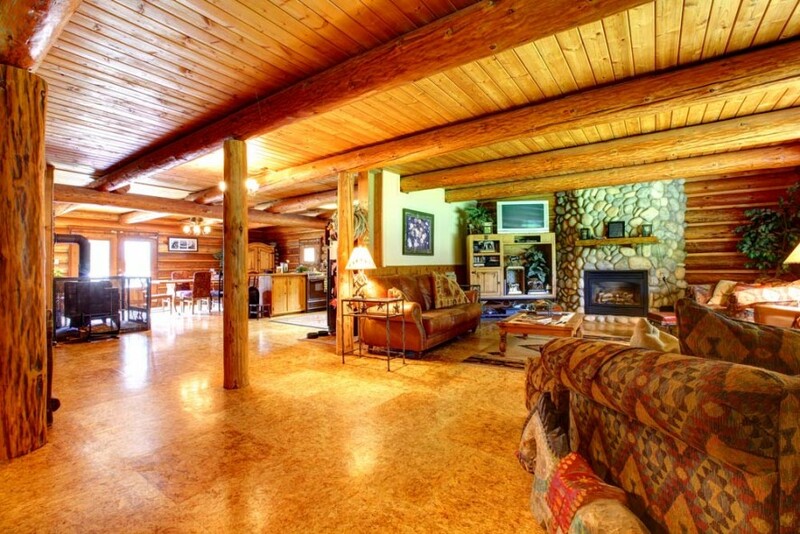 The logs on the wall are almost overshadowed by the stone fireplace and driftwood mantel. The large green rug brings more colors of nature into the room while the intriguing colored rug adds style.